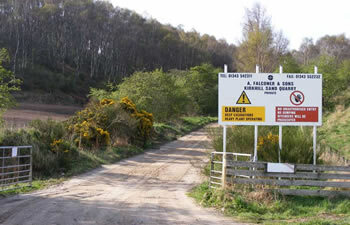 Kirkhill Sand Quarry owes its existence to the ice age this natural glaciel geological area provides the purest of sand based materials just as nature intended, simply the best quality material of its kind in the area. It has therefore been in existence for thousands of years so pre-dates the ancient and historic city and Royal Burgh of Elgin which is also steeped in history. As a religious centre the Cathedral presumably built from local stone may not have been built using our building or plastering sand, however, Kirkhill enjoys a commanding view over Elgin and the Cathedral. The Quarry lies approximately north east of Elgin on the outskirts enjoying a natural countryside location from our privileged vantage point we supply both finest quality building and plastering sand and can also supply rejects for use as a bulk fill material all to the specifications as indicated. Supplying the local building industry we have often been told that we have, in their opinion, the finest quality material of its type in the north and north east of Scotland. We would be delighted to offer the opportunity to as many customers as possible who feel they may benefit from our product. Being a glacial deposit, it is as natural and pure as nature intended. Our ex quarry prices, we feel, are very competitive. Alternatively it can be delivered in bulk loads to your premises or building site as the case may be. Having many customers large or small we load them all.The material can be loaded directly on to your chosen transport at the quarry or delivered to suit your requirements. 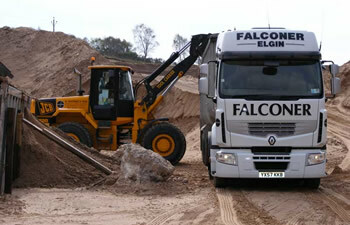 Bulk loads can be delivered from 3 1/2 tonnes to 20 tonnes +. Sand being a versitile and natural material has many uses for many applications. Our product is used for golf course purposes (bunkers) and as a cover over the membrane required prior to the topping of shredded rubber on equestrian training arenas. we have supplied our product for both purposes and would recommend its use for any such venture new or old. The sand has a sillica content and is free draining for this purpose.